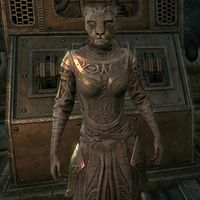 Apprentice Chirrhari is a Khajiit Apostle apprenticed to Lector Naril at the Everwound Wellspring. Her notes can be found on a table next to her. "You shouldn't wander the Wellspring unsupervised. It's dangerous! The factotums don't respond well to visitors they haven't been formulated to recognize. And the fabricants, they're just mean." Sherizar's the Wellspring's new apprentice. "A new apprentice? Really? But what does Chirrhari know of such things? This one works in the dark and grows fungi, molds, and mosses. The lector keeps me too busy for other concerns." Sherizar thinks there might be some sort of problem here at the oasis. "Chirrhari doubts there's anything sinister going on. Sotha Sil blessed the Wellspring with water, and Lector Naril's alchemical solutions make it possible to grow plants. It's good to see Sherizar, though. We could use the help." What about the apprentice selected last year? "Apprentice? Sherizar is the first new apprentice to enter the Wellspring in years. The lector stopped selecting apprentices after poor Gathal's accident. At least that's how this one understands things. I suppose Idrono might know differently." "Idrono works with Chirrhari. He attempts to grow non-fungal plant life in harsh conditions. Since you're going to speak to him, could you bring along some of my mushrooms? But not the poisonous ones. He hates those." We'll gather some mushrooms and bring them to Idrono. "Idrono will be grateful for the fungi samples, even if he seems agitated. He gets that way during the harvest. Make sure to bring him safe ones, though. My notes can help you identify the various types we grow." [Persuade] Can you formulate the factotums so they don't attack us? "No, only the lector can do such things. But perhaps this one has the next best thing. My plaque of safe passage. As long as you carry it, the factotums should leave you alone. Take it. It won't stop fabricants, however, so be wary of those beasts." Will you be all right without your plaque of safe passage? "Chirrhari will be fine. There is much to do right here. And the factotums are formulated to recognize me. The plaque is a precaution. For the most part. This one will get another one before the next work cycle begins." Tell me about Apprentice Gathal. This one only knows what Lector Naril told her. He said that Gathal injured himself while performing an experiment. He never recovered. It was a tragedy. Idrono pays much more attention to gossip, so perhaps he can tell you more." This page was last modified on 7 September 2018, at 07:53.